One of the largest living organisms in the world is found underground in Oregon’s Malheur National Forest. 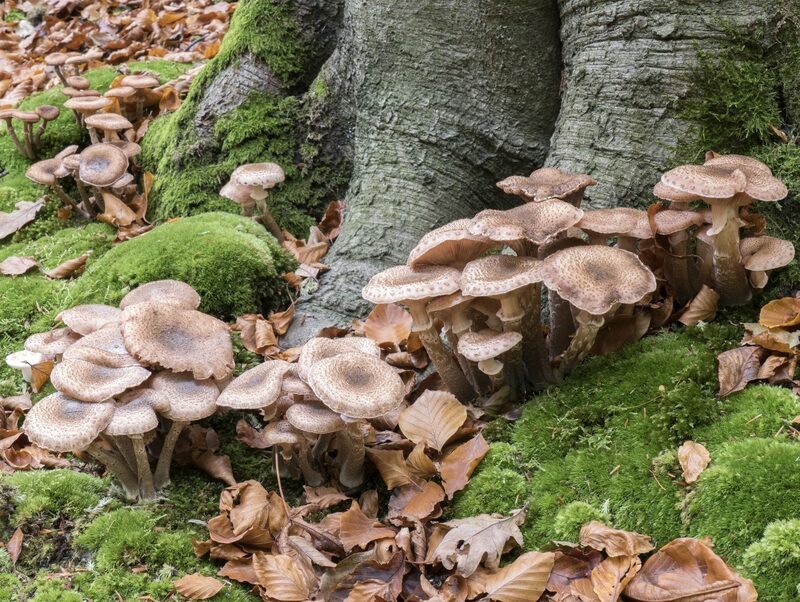 Wikipedia says the fungi, known as Armillaria Ostoyae is over 2,400 years old and covers 3-4 square miles. This fungi is out of sight, in the ground, and invisible from the surface. In autumn this beast blooms honey mushrooms, showing some evidence of what is growing below. As we enter autumn, we see changes in the air both in the economy/markets as well as weather/flora. But what is lurking below, what could be blooming? The US markets recovered in the third quarter from a slow start to the year. Large growth companies led the charge as they outpaced large value and small-cap stocks by a healthy margin. International stocks clocked a positive quarter, led by large-cap growth. We are happy to see positive numbers in the international sector as investors have been cashing out as of late. It is easy to become domestic-centric, but you must remember, foreign stocks account for roughly 50% of the world’s market and should have a place in your portfolio. 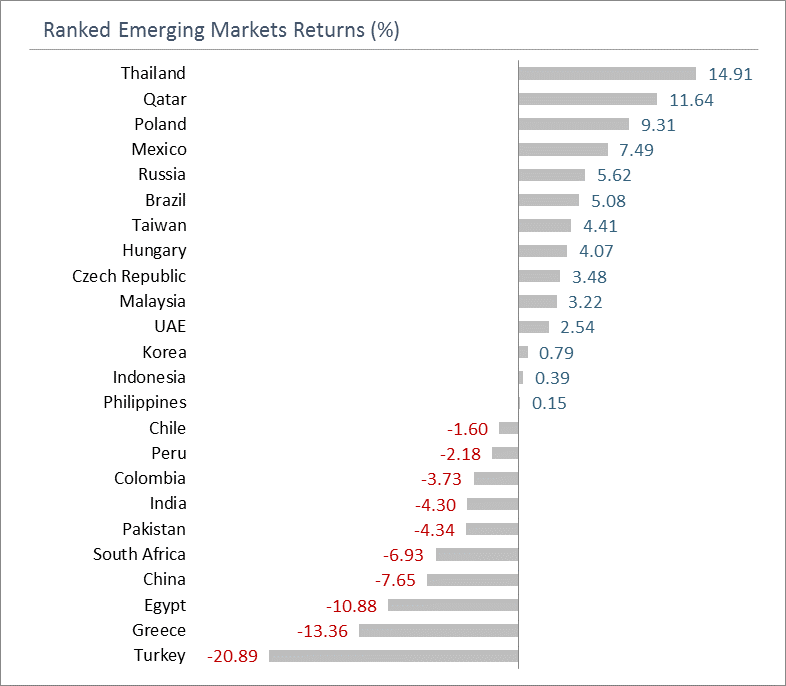 Emerging markets have continued to struggle as trade/tariffs have hurt. You will see in the next couple of charts, the US was not the best producing market last quarter. 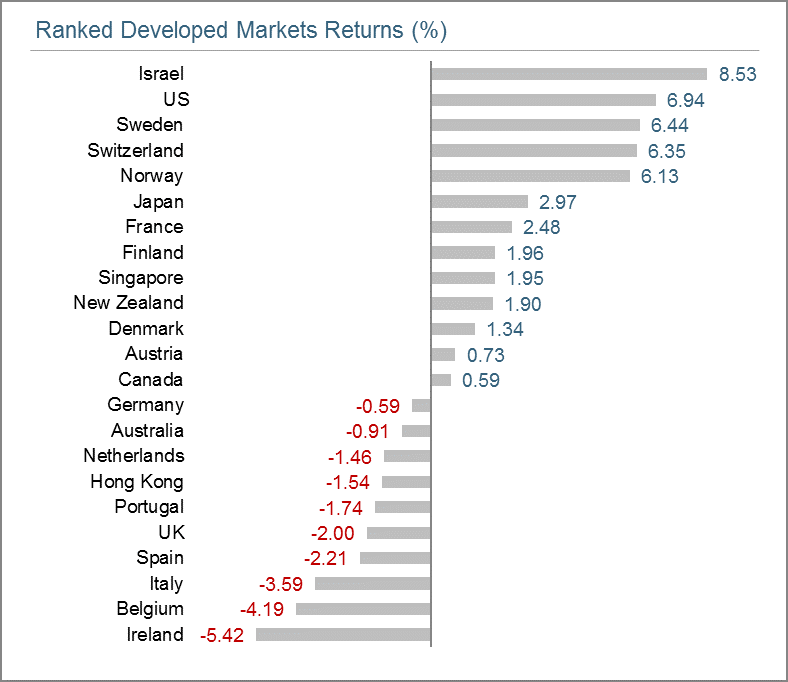 Israel took the top spot in developed markets, but Thailand led both the emerging and developed markets for the quarter. The US economic outlook is “remarkably positive,” according to Jerome Powell, Federal Reserve Chairman. He stated that his outlook is based on the fact that we have low unemployment and inflation being under control. Mark Zandi of Moody’s says that the “employment gains are broad-based across industries and company sizes,” which can signal a strong economy. Consumer confidence is strong, the consumer makes up about two-thirds of our GDP, which bodes well for the economy. The Institute for Supply Management (ISM) non-manufacturing index reached 61.6 in September, the highest we have seen since 2008. This strong reading shows a robust economy as a majority of the US GDP comes from the service sector. Investor sentiment has been very optimistic, but that is not reflected in their buying habits. Evercore ISI Research found that money is continuing to flow out of stock mutual funds and stock ETF’s. Interest rates have moved up, making the lofty stock valuations harder to justify. While the ISM number above was great, the concern is there could have been a surge before the looming Chinese tariffs. Strong consumer confidence has not been reflected in auto sales and home sales as both have weakened. 2018 has now bested 2000 as the highest percentage of initial public offerings (IPOs) listed with negative earnings. Back in 2000, 81% of IPO’s were from money-losing companies, today that number stands at 83% according to data compiled by the University of Florida finance professor Jay Ritter. With rates moving up, home equity line (HELOC) rates are around 6%, about a 10-year high. Many American’s use their HELOC to pay bills, and when that rate increases disposable income drops. 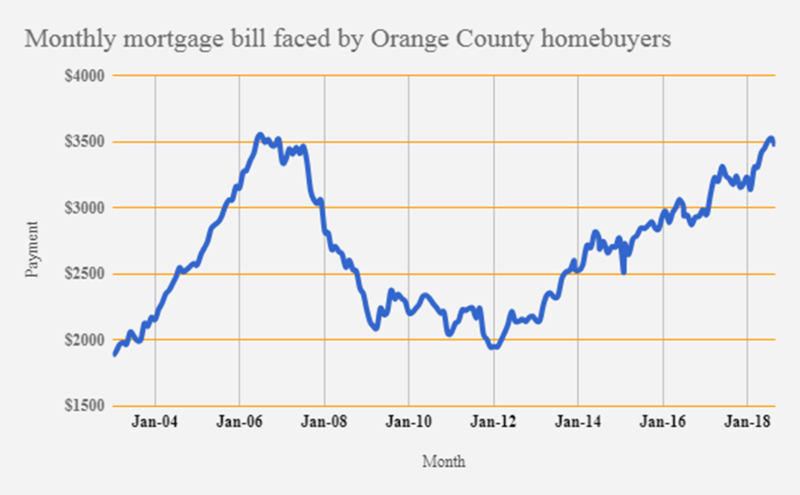 As you will see below, monthly mortgage bills are back at the highs we saw in 2006-2007. Granted the chart below is for Orange County, but you get the point. 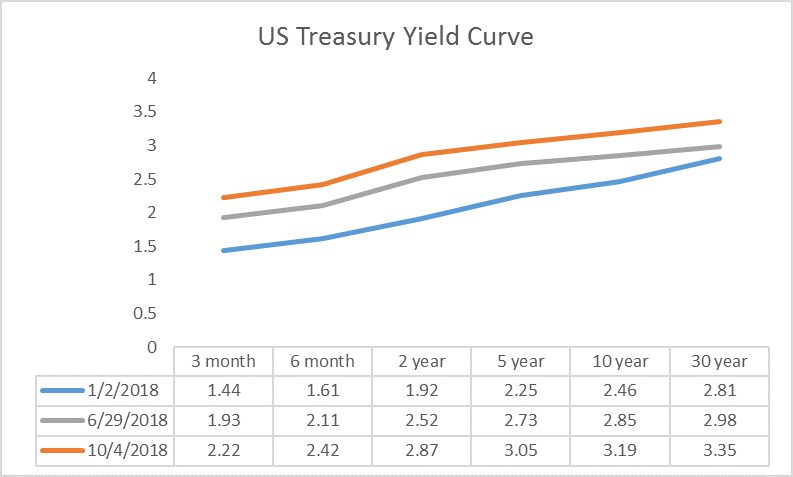 Interest rates moved along the entire yield curve. The 3-month moved 29 basis points (bps) in the quarter and 78 bps for the year. The widely watched 10-year moved 34 bps for the quarter and 73 bps for the year. We are solidly above the 3% handle on the long-term rates. New mortgage buyers are feeling the rate bump as the 30-year mortgage rate moved higher from the beginning of the year. We anticipate the Fed to do another bump in December. The bond market is starting to see inflationary pressures which have driven long-term rates up, as the 30-year had a dramatic push higher in the third quarter. Oil moved higher as the global benchmark Brent Crude, moved up 22% for the year, potentially inflationary. The US has taken on a lot of debt. In fact, as reported by the New York Times, the federal government could soon pay more interest on its debt than it spends on the military…and that is with low rates. Interest payments are now the fastest growing expense for the federal government, projected to hit $390 billion next year. Based on recent activity in the bond and stock markets, they are starting to show some worry, albeit slight. Companies are starting to talk about the effects the trade war could have on earnings. Emerging markets are still feeling the pain and US corporations are sitting on record-high debt. Timing markets have never been a fruitful endeavor. Besides, we are living much longer than we have in the past. Our time horizons are growing, making financial planning and taking a long-term view more important than ever. Case in point, the Sydney Morning Herald reported that Australia’s funeral businesses are hurting as not enough people are dying. Additionally, it was reported in the Nikkei newspaper that adult diapers will outsell baby diapers in Japan by 2020. 70 is the new 40. 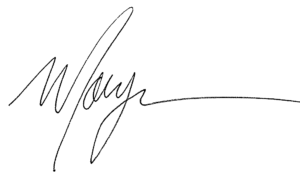 However, we do not intend to take added risks in your portfolios. We have been monitoring our holdings and may be making changes as we enter the New Year. We will be looking for those honey mushrooms that could foretell trouble lurking below. Happy Fall.